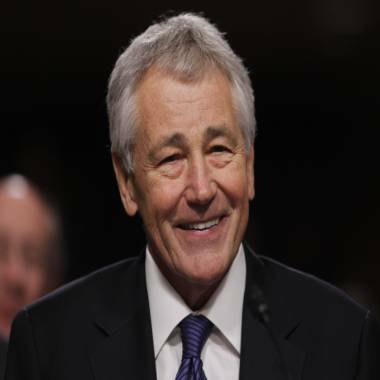 The Senate voted 58 to 41 to confirm Sen. Chuck Hagel as the next secretary of defense ending weeks of opposition by Republican senators who filibustered to delay Hagel's confirmation. NBC's Brian Williams reports. The Senate voted to confirm former Sen. Chuck Hagel as President Barack Obama's next secretary of defense following weeks of dogged opposition by Republican senators to their erstwhile colleague. The Senate voted 58 to 41 to formally confirm Hagel, on the heels of a procedural vote earlier in the day that cleared the way for Tuesday afternoon's final vote. That earlier vote dispensed with a filibuster that Senate Republicans had waged for a week and a half against Hagel, whose confirmation was delayed by Republicans past the President's Day recess in order to allow for more time to dig into the former Nebraska senator's background. A number of Republican detractors — including Sens. John McCain, Ariz., Lindsey Graham, S.C. and Kelly Ayotte, N.H. — reversed their votes on Monday in order to allow the Hagel nomination to move forward. The Senate voted 71 to 27 to move forward with Hagel's nomination, clearing the 60-vote threshold needed to end the GOP filibuster. A handful of the Republicans who allowed Hagel's nomination to come to a final vote ultimately voted against confirmation. In the end, Obama was able to win confirmation for Hagel, his choice to succeed outgoing Secretary Leon Panetta at the Pentagon. But not before Republicans were able to drag out the confirmation fight and, in the process, ding Hagel, their onetime GOP Senate colleague from the Cornhusker State. Republicans had fought strenuously to defeat Hagel, accusing him at points of harboring hostilities toward Israel, and sympathies for the Palestinian militant group Hamas. Tied into Hagel's nomination as well have been Republicans' long-running effort to ding Obama and his administration over their handling of the Sept. 11, 2012 attacks on a U.S. consulate in Benghazi, Libya. Former Senator Chuck Hagel testifies during a Senate Armed Services Committee hearing on his nomination to be Defense Secretary, on Capitol Hill in Washington, in this January 31, 2013, file photo. "What has their filibuster gained my Republican colleagues?" Senate Majority Leader Harry Reid, D-Nev., asked on the Senate floor. "Twelve days later, Senator Hagel's exemplary record of service to his country remains untarnished." Reid added: "Senate Republicans have delayed for the better part of two weeks for one reason and one reason only: partisanship." Hagel didn't necessarily help his cause during a combative confirmation hearing before the Senate Armed Services Committee. Republicans aggressively questioned Hagel on a variety of matters during the Jan. 31 hearing. Even still, Democrats held firm in their backing for the former Nebraska senator, helping to move his nomination forward. Republicans, though, managed to buy themselves more time — they said, to more fully investigate Hagel's background — by waging a filibuster against the nomination on Feb. 14. Democrats angrily protested the delay, especially as current Defense Secretary Leon Panetta planned to leave the job, as dangerous and unprecedented. Republican opponents of Hagel, though, said at that time that they would drop their objections to holding a confirmation vote after last week's recess.